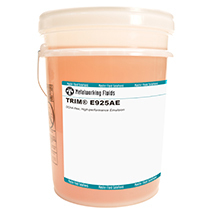 TRIM® E925AE utilizes a proprietary lubricity package to deliver exceptional surface finish and tool life on difficult-to-machine aerospace materials. Designed to lower total cost and improve manufacturing efficiency thanks to extended sump life. Environmentally friendly emulsion is free of DCHA, boron, chlorinated paraffins, and other halogens. Mild contact nature and low initial-charge odor provide an operator-friendly environment.